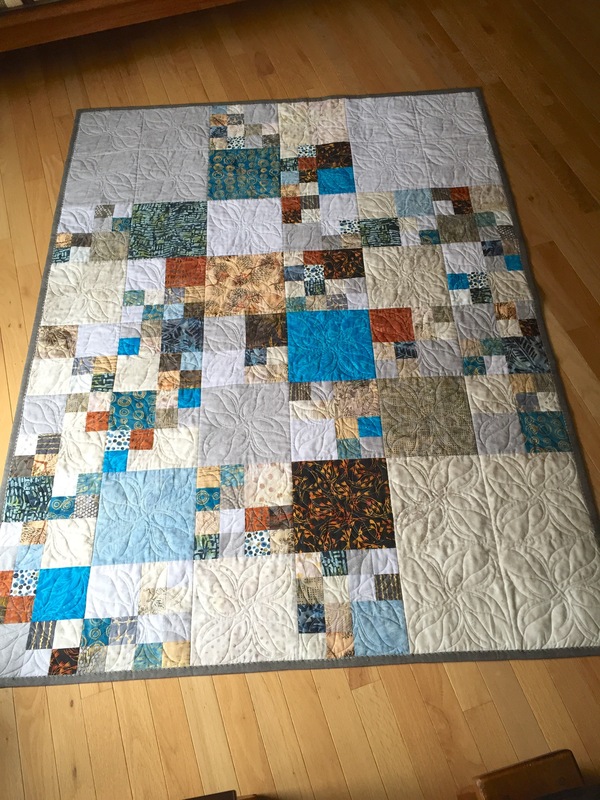 Some time ago I did a quilt based on 2.5, 4.5, 8.5, and 16.5″ blocks. What I was after in that quilt was to establish a pleasing colour flow using blocks of these varying, but proportional sizes. Sometime this past year I purchased pieces of the Moda “Blushing Peonies” fabric. My shop didn’t have all in the collection (and many I wouldn’t have wanted to use, anyway) so I went hunting for complementary fabrics. I ended up with 14. I wanted to do something similar with the Blushing Peonies showcasing the large print with beautiful flowers and fill in with the complementary fabrics in the smaller sizes. 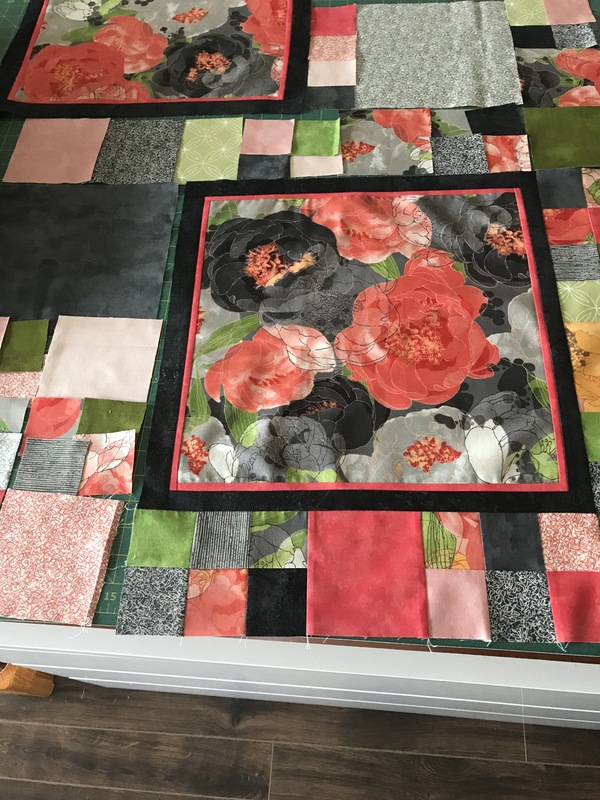 Unlike the original quilt, I don’t want the large peony blocks in the corners, but indented. The large, framed panel will finish at 16″. To fill in around it, I developed 4″ rows of 2″ and 4″ blocks to fill in below and on one side of the large block that will be in the lower right corner. I also want a 4″ row between this block and the next one which will be offset closer to the center. That means assembling more blocks that will create that row and a combination of 8″, 4″ and 2″ blocks to fill in above this first block and the offset second one. 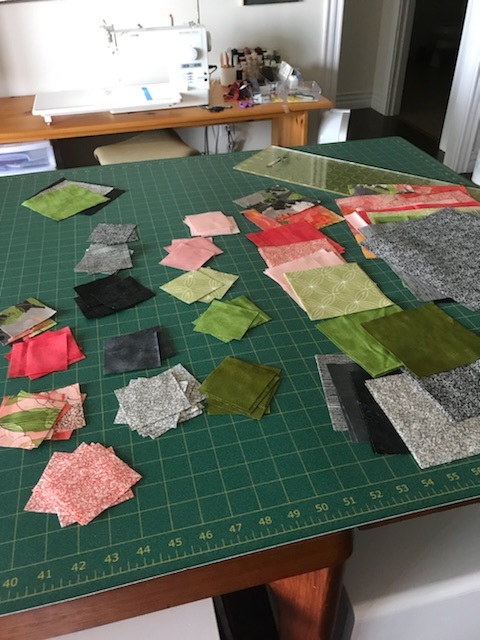 This is an improvisation – I should have enough blocks cut to assemble a quilt top. I’ve done enough for today. I’ll work on this quilt top again tomorrow.